Our aerofoil is an aerodynamically-profiled blade fabricated in the UK from extruded aluminium, teamed with a bespoke, robust bracket system that can be adapted for a range of shelf types and angles. The aerofoil has its own profiled, waterproof ticket strip, which will accommodate a client's existing price label dimensions. Our aerofoil kit is a high-performance system, tolerant to the full range of ambient conditions occurring in practice. It is suitable both for retro-fitting to existing cabinets in-situ, and for incorporation into new-build units. In 2015 Aerofoil Energy partnered with Williams Advanced Engineering (WAE), the technology and engineering services business of the Williams Group. Williams has some of the world's most powerful and advanced Cluster supercomputing capabilities. These are used to produce CFD (computational fluid dynamics) models, which are complex aerodynamic simulations of real-world situations. As part of the collaboration with Aerofoil Energy, Williams' scientists and aerodynamicists have used their CFD capabilities to create detailed simulations of supermarket fridges to help refine the aerofoil product. CFD is a fantastic tool and its use is becoming widespread, but this is only half the story. Williams use CFD to develop ideas, which are then tested in real-world settings. This is made possible from extensive investments in aerodynamic tools, including highly advanced wind tunnel technology. Our aerofoils have also undergone extensive and independent ISO standard laboratory testing. The result of the collaboration is quite simply one of the most advanced aerofoil profiles to be designed and proven in the market. Aerofoil technology for use in refrigeration was conceived using the principles of aerodynamics in aircraft. Aerofoils have very powerful effects on moving air-streams. They reduce turbulence and straighten falling air curtains back into shape. All multi-deck fridges employ a curtain of refrigerated air blown down across the open front of the shelves to help maintain the contents at a consistent target temperature. However, much of this cold ‘air curtain’ spills out of the front of the cabinet and into the store aisles. Not only is this wasteful from an energy perspective, but it also causes ‘cold-aisle syndrome’ with consequent negative impact on the shopper. Deployment of aerofoils on the edge of each shelf in the cabinet draws the cold-air curtain back into the fridge, thereby reducing spill, reducing energy consumption and improving aisle temperatures. What are the benefits of aerofoils? Fitting aerofoils to open-fronted multi-deck cabinets is proven to reduce energy consumption by up to 40%, as verified by lab testing in ISO conditions. As well as the consequent cost savings to retailers, this also represents a major reduction to their carbon footprint. Other benefits include reduced product shrinkage due to the stabilising effect that aerofoils have on product temperatures within the cabinet. An indirect benefit is to create warmer shopping aisles due to the reduced cold-air spill, thereby improving shopper comfort and extending browsing time. In comparison with glass doors, aerofoils are a barrier-free solution to the problem of cold-air spill, and a much less expensive, more robust alternative requiring minimal maintenance. The aerofoils themselves are made from 100% recycled aluminium, which requires only 5% of the energy required to produce new aluminium. We have, therefore, further enhanced the technology's energy-saving credentials by reducing our upstream manufacturing footprint. The energy performance of aerofoils has been tested extensively: more than 2 million test data samples were logged and analysed at Williams; ca. 60 lab tests (ISO23953) were conducted in independent test facilities; and real-world results have been verified through over 150 trial store installations in the UK and abroad. Quite simply, no other shelf-edge technology has undergone such rigorous testing. These trials have validated energy savings of up to 40% in laboratory and 25% in store conditions. In an increasingly environmentally-conscious world, aerofoils are an eco-friendly technology that contribute to lower CO2 emissions and product waste, thereby greatly reducing the retailer’s carbon footprint. Our aerofoils are listed on the UK Government's Energy Technology List, qualifying buyers for the Enhanced Capital Allowances scheme so allowing them to write down the full purchase value against corporation tax in the year of purchase. For new refrigeration, purchasing aerofoils has an even greater tax benefit. Until recently, many display fridges were listed on the Energy Technology List, enabling retailers to claim substantial tax breaks when buying new equipment. However, in August 2015 the energy performance thresholds for refrigerated display cabinets were raised. As a result, many of the multi-deck display fridges were de-listed and no longer qualified for ECA benefits. Fortunately, aerofoils have been tested with a wide range of multi-deck cabinets currently on the market, and the consequent energy performance improvement means that these cabinets meet the new regulations and once again qualify for ECA treatment. How easy is it to install aerofoils? We have engineered a bracket kit that provides an extremely rigid yet simple and unobtrusive attachment between the shelf edge and the aerofoil. No drilling is required and hence there is no requirement to de-merchandise the cabinet. The system is also designed to accommodate a mini- or full-sized riser to facilitate product alignment. All but the largest stores can be retro-fitted with aerofoils in a single night. Aerofoil Energy has managed the seamless installation of some half a million aerofoils in over 2,000 stores for the UK's largest supermarket chains. No other provider of shelf-edge technology has such extensive experience. Our in-house procurement, supply chain and project management capabilities mean we can offer retailers a direct-to-store supply or full supply-and-installation service. We have trained and have at our disposal around 100 installation engineers covering the whole of the UK and Ireland. They work swiftly and efficiently whilst adhering to our own exacting quality standards and our clients' health-and-safety protocol. Speed of fit is also critical for us and our clients, to help minimise the installation costs of a major roll-out project. We have therefore approached the design of our bracket attachments with the mindset of a Formula 1 pit crew. For example, our custom snap-fit bracket has reduced installation time to seconds for one of our clients. Driven by the success of the aerofoil system, we put together a team to take us one step - in fact several steps - beyond. The 'Vortex' team comprises highly-skilled practitioners with over 150 years of combined industry expertise. Moreover, they have joined forces with our technical partner, Williams Advanced Engineering, to deploy some of the world’s most advanced R&D technologies, including high-fidelity computational fluid dynamic modelling and independent EN23953 laboratory testing. Together, they have been working quietly behind the scenes for the last three years, identifying and addressing some of the key energy performance losses in multi-deck cabinets, and developing horizontal innovations besides. In fact we've already introduced some of this new technology to the market, but we've not made a song-and-dance about it; our technical experts are not the extrovert type. The simple fact is that fitting aerofoils to your cabinets will deliver up to a 40% improvement in energy performance in laboratory and 25% in store conditions. A straightforward, quick-to-implement solution. However, we knew we could improve upon the savings achievable from aerofoils alone. So in conjunction with Williams' senior aerodynamicists, we have climbed inside a multi-deck cabinet (virtually, that is) to model every aspect of its aerodynamic and thermodynamic behaviour. We are now developing solutions to common problems including product temperature hot-spots and warm air ingress, as well as overcoming the energy losses associated with sloped shelving. Our aerofoils already do an unparalleled job of straightening the cold air curtain and retaining it within the cabinet. Some multi-deck cabinets, however, have wide air discharges or discharges that are set forward from the shelf edges. Hence, we turned our attention to the function of the air-discharge mechanism in the cabinet canopy to see if we could increase the uniformity of the air curtain at the point of origin. In turn, this would enable us to fit aerofoils as close to the shelf edge as possible, in fact no more than our target maximum of 70mm away. To achieve this, we have developed and launched two new technologies that further assist in both straightening and narrowing the air curtain. Our 'aerosteer' product reduces the width of the air curtain, and our 'aerorev' device modifies the vertical plane of the air curtain to bring it closer to the shelf-edge. Without these devices, any form of air-guiding technology would have to be positioned an uncompromising distance from the shelf-edge for it to work properly. Both of these products deliver energy savings in their own right by reducing cold air spill. We're now deploying them in combination with aerofoils to maximise energy performance whilst minimising the shelf-to-aerofoil gap. When we ask customers and store staff what they think of our aerofoil installations, their lack of reply and slightly puzzled look is just the response we want. The aerofoils go completely unnoticed. Perfect! Nonetheless, we are constantly preoccupied with the aesthetic qualities of our aerofoil and so we set out to make it even more inconspicuous. The result is our micro-aerofoil, a low-profile aerofoil that performs just as well as our standard aerofoil, and is more suited to clients with smaller ticket labels or narrower shelf-edge profiles. We're not just about energy performance, and our in-house retail experts have recognised how aerofoils can serve as a springboard for other consumer-friendly technology. The intellectual property embracing our original aerofoil patent therefore made provision to integrate electronic shelf labeling (ESL) within the aerofoil blade. Given the gradual adoption of ESL in the retail industry, we have embarked on a development project in conjunction with a leading ESL provider. This exciting initiative will combine the latest thin-film, energy-harvesting and battery technology to incorporate electronic pricing seemlessly within the customer-facing aerofoil. That's the front of the aerofoil, but what about the rear? We knew from the start that aerofoils would sit an ideal distance from the shelf to serve as a mounting for product illumination, and our patent portfolio therefore includes incorporation of lighting in the aerofoil blade. Our Vortex team have added this to their product pipeline, again exploiting the very latest in LED lighting and battery technology. Our Vortex team has been so successful in fulfilling their original brief that we've given them free rein to take the project forward with some real blue-sky thinking. Furthermore, we want to do this in close collaboration with our retail and OEM partners. Aerofoil Energy continues to develop new and innovative solutions for improved energy performance in commercial refrigeration. Below is a list of our current granted and pending patents, along with product designs registered by the company. Our aerofoil technology has been internationally acclaimed, and Aerofoil Energy in conjunction with Williams Advanced Engineering has received the following awards. The IET Innovation Awards were founded in 2005 and recognise and reward the best new innovations in engineering, science and technology. These annual awards are open to all innovators, and industrial companies of all sizes, academic departments and enterprising individuals have won over the years. There are 15 categories, covering the breadth of the IET’s activities, and each category is independently peer-reviewed by a panel of experts in that field. The object on display, made by Williams Advanced Engineering and Aerofoil Energy Ltd, won the Horizontal Innovation Innovation Award in 2016. Open-fronted, multi-deck refrigerators that line the aisles of supermarkets consume excessive energy, primarily because of the open front. These fridges have a cold air curtain to make them safe. Much of this falls out and has to be continuously replaced. Aerofoil Energy and Williams developed a retrofittable aerofoil that attaches onto each refrigerator shelf to retain more of the cool air. Aerofoils control the direction of air flow and are fundamental in the design of F1 cars to channel the flow of air and create downforce. The technology brings significant energy savings, reduces both carbon footprint and “cold aisle syndrome”. Aerofoil Energy and Williams Advanced Engineering were finalists for the 2018 MacRobert award. 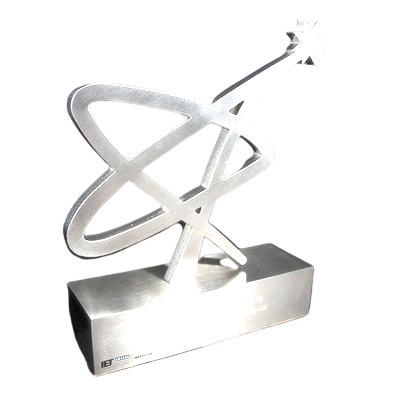 The MacRobert Award is the UK's longest-running and most prestigious national prize for engineering innovation, recognising outstanding innovation, tangible societal benefit and proven commercial success. Originally founded by the MacRobert Trust, the Award is now presented and run by the Royal Academy of Engineering, with support from the Worshipful Company of Engineers. Combining cutting-edge technology with four decades of success in Formula 1, Oxford-based Williams Advanced Engineering (WAE) has been working with Aerofoil Energy since 2015 to develop the Aerofoil shelf-edge technology. This aerodynamic device significantly reduces the energy consumed by refrigerators in supermarkets and convenience stores by ensuring that more of the cold air stays in the chiller. Since January 2017, 130,000 Aerofoils have been installed in supermarkets and convenience stores, with a further 300,000 in production and planning. As of March 2018, Aerofoils have been fitted in over 1,000 stores and by the end of 2019 Aerofoils are expected to be fitted in nearly 3,500 stores. In collaboration with Williams Advanced Engineering, Aerofoil Energy proved its energy saving credentials yet again by winning the Horizontial Innovation category award at the prestigious IET Innovation Awards. Judged by engineering experts, the Innovation Awards recognise the depth and breadth of innovative work being carried out across all areas of engineering and technology. A champion of environmentally friendly technology, Aerofoil Energy appealed to judges because of its extensive research and development, which shows energy savings and design refinement. In an increasingly environmentally conscious future, the development and implementation of energy saving technologies is an important consideration for large supermarkets. The global potential of Aerofoil Energy's environmentally friendly technology earns recognition at award ceremonies. 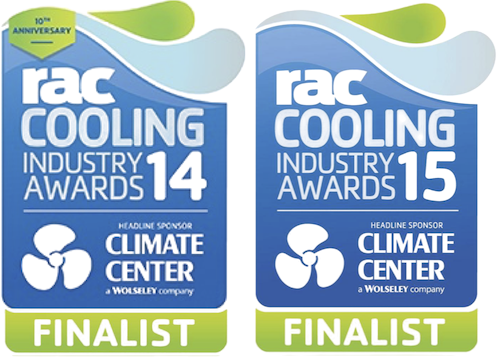 The RAC Cooling Industry Awards champions the leading innovations and environmental successes in the refrigeration and air conditioning industry. In 2014, right at the start of the development of Aerofoil Energy, we were finalists in the "Refrigeration Innovation of the Year" category, and in 2015, finalists in "Environmental Collaboration of the Year" together with Williams Advanced Engineering, EPTA and Sainsbury's. In 2016, Aerofoil Energy was a finalist at Cleantech Innovate, a conference that showcases the latest in clean, low-carbon emerging innovations. Download brochures and other information about Aerofoil Energy and our technology.